I think I need to come clean … even if that does mean eating a little chicken crow. I wrote a post on the absurdity of modern chicken coops and how the cost does not justify the claims of why someone would or would not decide to get into the chicken and egg game. 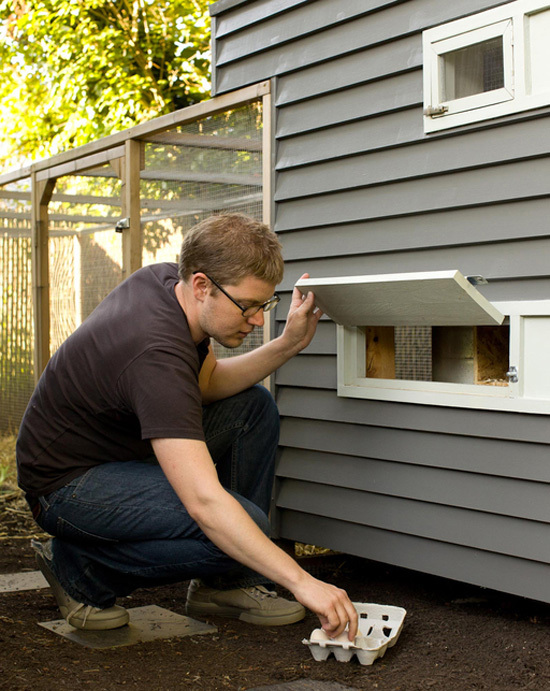 ( Chicken Coops…Really? ). …and I am completely fine with that. In fact, sign me up because I like fresh eggs, I like being a part of the local food movement, I would like to have the bugs in my yard eaten up. I want all these things … but it’s really about having a really cool chicken coop. This is the nogg and I think this is one of the first modern chicken coops I’ve seen that I think is intrinsic. Even if you never put a chicken into this thing, it would still well made, have an evocative shape, have all its parts considered … in other words, be really cool. The nogg is an enterprising collaboration between furniture designer and engineer Matthew Hayward and Creative Director Nadia Turan. It is a great example of how a random thought became a reality when a number of friends and relatives were excited about keeping chickens. We decided to come up with an alternative chicken coop and a brand that would surprise and delight us just as much as those first fresh eggs will. It wasn’t long before we thought of the shape and design details and after an arduous, stressful year the nogg (prototype 01A) hatched. Engineered and crafted by hand in the UK, the nogg is made from strong cedar wood which is fresh scented and naturally resistant to bacteria. Stainless steel trimming, locks & fasteners and the elevated glass dome gives the nogg a contemporary feel and is reassuringly safe and durable. The doors have been created with a stainless steel frame and ribbing to combat the possible effects of the elements. The innovative glass top twists and lifts to aid ventilation and is just one of the details that really elevates the idea of what a domestic coop can be. 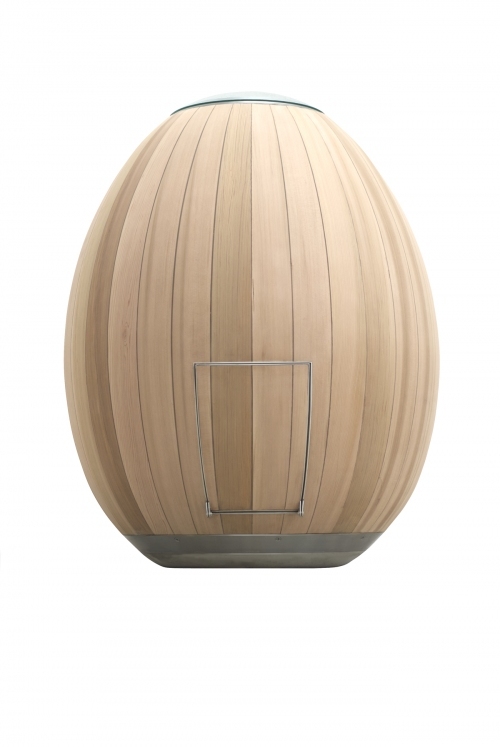 The nogg sits on a concrete base fastened with stainless steel rings that keeps it damp proof and stable. 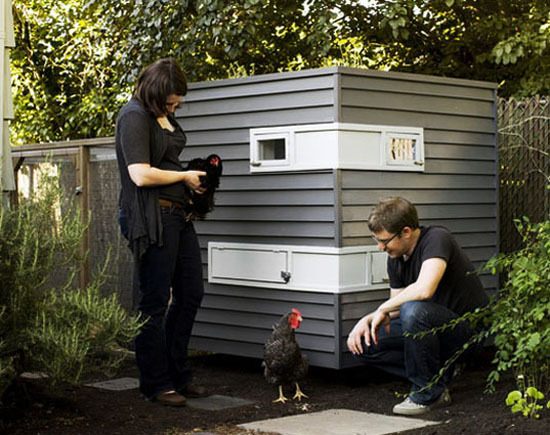 There are other modern chicken coops as well – although this next one isn’t commercially available. It is the product of two people (from architect Mitchell Snyder and designer Shelley Martin) who like chickens and they like design. 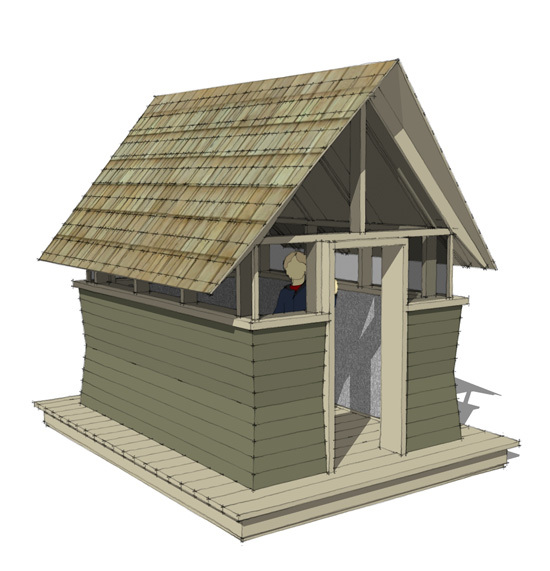 Pretty simple – maybe that’s why this non-traditional chicken coop resonates with me. 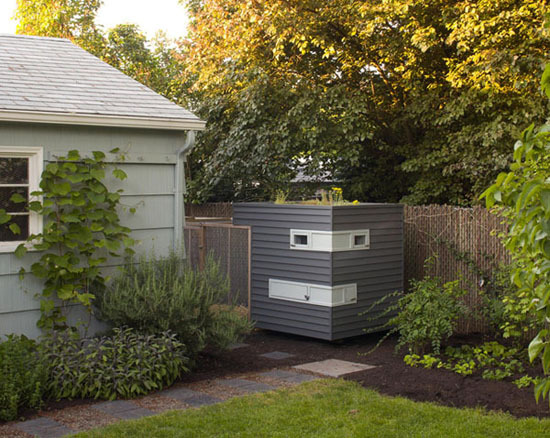 The look might not be right for everyone but looking at the pictures below, it certainly seems at home in the backyard of their Portland home. Made of reclaimed cedar siding and complete with a green sod roof suitable for planting lettuce and other garden munchies, this coop appeals to the problem-solving do-it-yourself’er in me. (chickens clucking) bwaack bwaack bwaack !! Yes, this could easily be turned into an attractive and very functional chicken coop – one that would (at 2 square feet per chicken) comfortably house (6′ x7’6″ … carry the 3 …) a lot of chickens. Although, this one wouldn’t require you to bend over and duck squat (much – for scale, that’s a 42″ child, the entire structure is under 7′-6″) through the door to clean out the coop. I might just modify the design a bit and see what sort of interest I can “round up” from urban farmers in my modern chicken coop.